Today's column is going to introduce something that my Tumblr followers are well aware of, a tool known as the Storm Scale. It measures how likely it is for a mechanic to return in a Standard-legal set. I am going to explain exactly how it works and then use it to talk about all the mechanics in Khans of Tarkir block. Hopefully, that sounds fun. It all began innocently enough with a simple question on my blog (known as "Blogatog"). A reader wanted to know the chances of the mechanic storm (originally from the set Scourge) returning to a Standard-legal set. I said it was low. Storm is one of if not the most broken mechanics of all time. I didn't think its chance of coming back in a Standard-legal set was likely. To stress my point, I said if we had a scale of how likely something was to come back, with 1 being very likely and 10 very unlikely, Storm would be a 10. This led other readers to ask about where other mechanics fell on this "Storm Scale." Before you knew it, the Storm Scale became a regular feature on Blogatog, with people always asking where mechanics fall. Today, I've decided to bring my Storm Scale to Making Magic. I am going to explain it in detail—more detail than I've ever even explained on my blog—and then use it to look at all the mechanics from the Khans of Tarkir block, a number of which will soon be rotating out of Standard with the release of Shadows over Innistrad. This category is full of mechanics I refer to as deciduous. They're things that any set has access to, so they can show up whenever a designer needs them, but they're not something we expect to show up in every set. This category has a wide range, as shown by the examples—cantrips show up very frequently, while double-face cards do not. This category comprises mechanics that are very popular with the players and have enough design space that I am confident we can bring them back. This category is comprised of popular mechanics, usually ones we've already brought back at least once, that have some outstanding issue. For example, morph is a bit complex, especially at common; kicker is a little too broad, stepping on the toes of new mechanics; and imprint has a tight design space. These are mechanics I think we'll see again, but the complications make me a little less sure than the ones in level 3. This category is of mechanics that players enjoyed when they played with them in the past, but require the right fit to bring back. I'm optimistic we'll see them again, but I know they're going to need the right environment to return, so they are likely but not guaranteed. This category is for mechanics that players liked but are tougher to find a home for. Sometimes this is because they were tied to a specific flavor, while other times it's a matter of needing a specific mechanical support. This category is for mechanics whose popularity was mixed. There's no great reason to reprint them, but I could imagine if the right environment came along where they were a perfect fit, we'd consider them. This category of mechanics are things kind of like level 7 but with extra issues attached. For example, madness has rules/developmental issues; echo, as a downside mechanic, turned off a lot of players; and suspend had major templating/confusion issues. These mechanics not only require the perfect environment but would also require us to be able to fix the additional issues. This category tends to be for mechanics that are both unpopular and have major issues to deal with. We're not very inclined to bring them back, and even if we wanted to, there would be issues that would have to get dealt with first. This category is for mechanics that usually broke the game in some way and would be problematic to bring back even if we felt they were a good fit. This scale is in flux. It's an ongoing exercise that I am constantly learning about. In fact, writing this article has taught me a bunch of things I hadn't put into words before. This means that ratings might change over time because I'm getting a better sense of how the scale works. Also, there are other factors that can change (for example, someone who hated a certain thing has left R&D, making it easier to do) that will result in a rating moving. This scale is not based on advance knowledge. If I know we are, in fact, going to bring something back, I don't lower its score. I try to make all my ratings ignoring what I know of the actual future. Not everything fits perfectly. My descriptions above are me trying to give more concrete examples to each category. There are things that will fit in certain levels because that's where I feel it goes on the sliding scale, but it might not line up exactly with what I said. For instance, a mechanic might be at level 4 because I feel it's less than level 3 and more than level 5, but it might not match exactly what I said above for the category. I'm fallible. A lot of my past ratings were me making guesses at all hours of the day on social media. Some of them were just bad guesses, which I correct the next time I rate it. 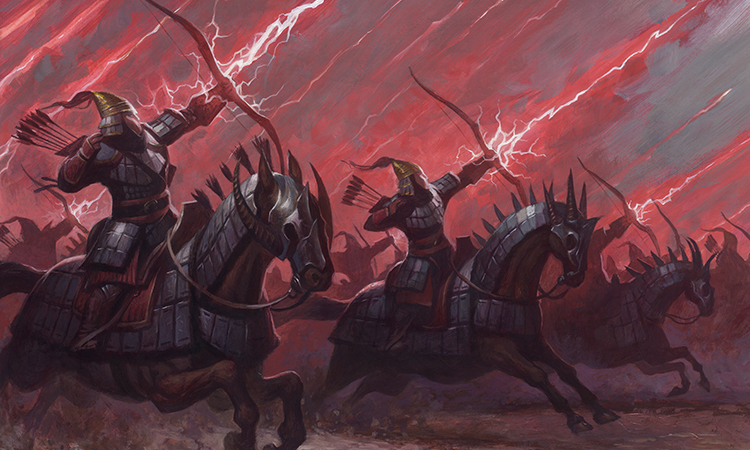 Now that I've explained the Storm Scale, I am going to use it to look at the mechanics from Khans of Tarkir block. Much of the block (Khans of Tarkir and Fate Reforged) is about to rotate out of Standard, so I thought it would be a good time to look back at the mechanics of the block and examine which ones we might see again and which ones we more than likely won't. To do this, I am going to look at each mechanic through five lenses. Very Popular—This means that through our market research, this mechanic falls in the top 25% of mechanics of all time. Note that all these categories are comparing the current mechanics against the mechanics of all time (well, since we started doing market research many years ago). Popular—This means that through our marketing research, this mechanic falls above the average but not in the top 25%. Liked—This means that through our research, this mechanic falls below average but not in the bottom 25%. I should note that we aim for our average to be well-liked, so being below average doesn't mean the majority of players don't like it, just that there are more mechanics they like more. Being in this category doesn't keep you from having a chance to return. Unpopular—This means that our research puts this mechanic in the bottom 25%. Falling in this last section does decrease the chance of a return. Large—This means that this mechanic has lots and lots of design space. We can bring it back again and again and most likely won't have any issues making new cards. Medium—This means that this mechanic has a decent amount of design space and we could easily bring it back, but possibly a limited number of times. Small—This mechanic is pushing the boundaries of its design space in this set. It would be difficult to make enough new cards to bring it back. Flexible—This mechanic is easy to use, requires minimal support, and interconnects easily with other mechanics. Neutral—This mechanic is a bit harder to use, often requires some support, and/or has issues when connecting to other mechanics. Rigid—This mechanic is very hard to use, requires extensive infrastructure to work, and/or is actively hostile when trying to mix with other mechanics. Not Problematic—Development did not have any problem developing this mechanic. Neutral—Development had some issues developing the product, but nothing major. Problematic—Development had significant problems developing this mechanic. Playability not affected—This means the mechanic had no issues interfering with playing it. Playability affected—This means the mechanic had one or more issues which interfered with playing it. So now we're going to take each of the thirteen mechanics from Khans of Tarkir block and look at them through each lens. I will then give each a ranking on the Storm Scale. This mechanic was in the bottom half of the listing of mechanics of all time, but just barely. Morph is a bit more polarizing than most mechanics, meaning that its fans really enjoy it while its foes really don't. The fact that every morph card can be cast as a three-mana 2/2 definitely pinches the design space, but within that space there is a decent amount that can be done, especially with morph triggers. The mechanic is a bit tricky when we're putting it in a set and does require a decent amount of infrastructure, but it interacts nicely with a lot of other mechanics. Morph has different issues depending on whether you're looking at Constructed or Limited. In Constructed, making a three-mana 2/2 is tricky, as that is so far from a Constructed-playable creature that it forces R&D to give the card a very big reward for using it. In Limited, morph tends to warp the environment around it, making cards that kill 2-toughness creatures more powerful than normal. Morph is a complicated mechanic and makes use of card backs in a way that few other mechanics do. As such, it is a bit overwhelming for less experienced players. It also requires the logistics of turning cards over, which can at times cause issues. This is the one rating that shouldn't be a surprise, as I used it as an example above. That said, based on the criteria I just listed, this mechanic seems like it should be rated a little higher. This goes to show that the Storm Scale has some subjectivity to it. Morph plays a key role in Magic's history, and while it has its share of issues, it's definitely something that has become an iconic part of the game and thus something I believe we will one day see again. Raid was in the top half of mechanics, but just barely. Raid can go on creatures or spells. Attacking is a major part of the game, so the trigger is pretty easy to meet with most decks. The reason it's medium and not large is that the effect has to be something that is useful after attacking, which knocks out a decent amount of effects. The mechanic is easy to use, doesn't require much infrastructure (as attacking is so key to the game), and plays well with many other mechanics. Development had no issue with raid. Raid is straightforward and easy to understand with no logistical issues. All the factors point toward raid coming back. Outlast was in the bottom 25% of mechanics of all time. The reason we chose to not use outlast in Fate Reforged was we didn't believe we could make enough cards for a second set. Outlast is a very narrow mechanic. The mechanic, while easy to understand, is a bit complex strategically to use. It requires some infrastructure to make the +1/+1 counters have extra value. It did have some nice interaction with other mechanics in the set, though. Outlast has the problem where the cards look worse than they actually are, which means making appealing but not overpowered outlast cards was very tricky. Outlast uses counters and has support cards that grant abilities to creatures with counters. The mechanic requires a little extra attention to track, especially when played by an opponent. I don't expect to see outlast come back, but I could imagine we find the environment where it's a perfect fit and we'd consider it. Prowess was the most popular mechanic in Khans of Tarkir and Fate Reforged and the second most popular mechanic in the block (rebound was first, making raid the most popular new mechanic in the block). Prowess only goes on creatures, but it's quite flexible and can be used to make a very large number of creatures. The mechanic is easy to use, doesn't require much infrastructure (casting noncreature spells happens in almost all games), and plays well with many other mechanics. Development had no issue with prowess. Prowess is straightforward and easy to understand with no logistical issues. We (and you) liked prowess so much we made it evergreen, which means you will for sure be seeing it soon. Prowess wasn't in Battle for Zendikar Block (with the exception of Umara Entangler and Stormchaser Mage) but does return in Shadows over Innistrad block. Delve definitely has its fans, but it still falls below average for mechanics. Delve can go on any spell type, but requires larger costs to make the cost reduction meaningful. Delve interacts just fine with other mechanics but usually requires a little support to be able to use it efficiently. Delve is hard to cost, as it's a cost-reduction mechanic. It puts a lot of constraints on both the Constructed and Limited environments and can easily break with effects we often like to do. Delve is easy to use. It requires exiling but usually isn't logistically taxing. In order for it to return, we have to both find the right spot to use it and solve many of its development issues. Ferocious proved to have some design space, but the need to make things relevant when your 4-power creature showed up cut off a bit of it. Ferocious was easy to use and interacted with other mechanics well enough. It required creatures to work, but luckily, that's a pretty important part of the game. Development had no issues with ferocious. Ferocious didn't cause much confusion nor logistical issues. Ferocious is the poster child of a mechanic I never see a need to return but could possibly come back one day if we somehow end up with an environment where it's the perfect fit. Manifest was in the upper part of the bottom half of mechanics. It was definitely a bit more popular with enfranchised players. Manifest, on its surface, acts like a token-making mechanic, which tends to be somewhat limiting as to how many cards can be made in a single set. Manifest is a tricky mechanic to design with. It requires a bit of infrastructure. Luckily, it plays nicely with a number of other mechanics. Development's biggest issue with manifest is that it acts a lot like a token-maker, which is tricky to make Constructed-worthy. Morph is a complex mechanic. Manifest is more complex than morph. It also has all the logistical issues morph has plus extras, because it can turn things face down that don't naturally have the manifest mechanic. Manifest has a lot to overcome to return. Its one saving grace is that it's very novel and has good gameplay. Bolster was in the top half of mechanics, but just barely. Bolster can go on creatures and spells. It's pretty open design-wise, but it only tends to feel right if all the pieces mesh, which limits the potential number of cool designs. Bolster is easy to design around, doesn't require much infrastructure, and plays well with a lot of other mechanics. Development had no issue with bolster. Bolster was easy to understand and didn't have any logistical issues. Bolster was fun and generally well-liked. It's the kind of mechanic I expect to eventually find a home for, but not something we'll build around. Dash was in the top half of mechanics, but just barely. Dash can only go on creatures, but we've discovered that there are a lot of different ways to use it. Dash is easy to design around, requires minimal infrastructure, and plays well with many other mechanics. Development had no issue with dash. Dash was easy to understand and didn't have any logistical issues. I think it's a matter of when we'll see dash come back, not if. Megamorph is the lowest-scoring mechanic of all time. Megamorph can make a lot of cards, but as with morph, the three-mana 2/2 body will always cause bottlenecks. Megamorph has all the issues of morph. Development's issue with megamorph are mostly the same it has with morph. Megamorph, interestingly, was actually easier to develop than morph because the +1/+1 counter helped encourage players to cast it face down, something that development wants to encourage but is hard to do in Constructed play. Megamorph had all of the issues of morph, plus added +1/+1 counters. This mechanic would rank lower, except it was so poorly received by the players. My guess is if we ever wanted it to come back, we'd just refer to it as morph and have the +1/+1 counters spelled out. I think we might have forever burned the name "megamorph" (which was a goofy name to begin with). Rebound was the highest-rated mechanic in Khans of Tarkir block and was rated in the top 25% of all time. Rebound can only go on instants and sorceries and has to involve effects that you want to happen on two consecutive turns. Rebound is easy to design around, requires minimal infrastructure, and plays well with many other mechanics. Development had no issue with rebound. The one strike against rebound is that it has memory issues, as players have to remember next turn that they have a delayed effect happening. Rebound is popular, and we can design fun cards with it. I am pretty confident rebound will, well, rebound. Exploit just barely snuck into this category. It's on the low end but not quite in the bottom 25%. Exploit goes on creatures and has to essentially generate a spell effect. It's the kind of mechanic that you can design a lot of cards for, but very few of them will be elegant. Exploit is tricky to design around and requires a little infrastructure to work. It does play nicely with other mechanics, though. The only strike against exploit is that some less experienced players don't like being forced to sacrifice their creatures. Exploit has a bunch of issues, but it is the kind of mechanic that could one day be the piece of a design puzzle that helps make things work. Formidable was in the bottom 25%. The only thing that ranked lower than formidable, of the thirteen Khans of Tarkir mechanics, was megamorph. Formidable plays around in a design space that doesn't have lots of room. Technically it's probably somewhere between small and medium. Formidable required some infrastructure of creatures, but other than that it wasn't too hard to design with. It played well with mechanics that made creatures bigger. Development had no issue with formidable. Formidable required a little math but other than that was easy to understand. I expect formidable to go to the place where unloved mechanics go to spend the rest of their days, most likely never to be seen again. That's all the time we have for today. I'm curious to learn if you're interested in the Storm Scale and whether or not you want me to talk about it again in future Making Magic columns. You can email me with feedback or talk to me through any of my social media accounts (Twitter, Tumblr, Google+, and Instagram). Join me next week when I tell you all what you all tell me. Until then, may we all bid a fond adieu to Khans of Tarkir and Fate Reforged. "Drive to Work #308—Limited Edition, Part 2"
This is the second podcast of a six-part series on the design of Limited Edition (Alpha), Limited Edition (Beta), and Unlimited Edition. "Drive to Work #309—Limited Edition, Part 3"
This is part three of a six-part series on the design of Limited Edition (Alpha), Limited Edition (Beta), and Unlimited Edition.